Food Labels - What Do All Of Those Little Letters Really Say? I translated this from Portuguese. This is an article clarifying labeling. I'm doing a poll. If you see "diet" on a product can you email me and tell me what the word means to you? Read on. Food Labels - What Do The Little Letters Really Say? Although industrialized foods make our racing lives practical, one detail is almost always overlooked by the consumer: the labels. Yes, they contain ingredients that are difficult to pronounce, which may cause some lack of interest in discovering their purpose in composition. And that is where the danger lives. The amount of preservatives and chemical ingredients associated with excessive consumption of these processed products can lead to obesity, heart disease, diabetes and other serious illnesses. According to the Brazilian Association for the Study of Obesity of the Metabolic Syndrome, more than 50% of the population is overweight or obese. This is one of the countless data that is closely linked to the consumption of industrialized foods. So if you're the team that picks up the products on the shelf because they are attractive and named fit, it will make healthier (real!) And smart choices from now on. In addition to the mandatory nutrition information (calories, carbohydrates, fats, etc. ), all food labels need to show the list of ingredients, their origin, shelf life, liquid content, batch and possible allergen items. Mônica Johansen Stockler, nutritionist and consultant at Internutri, explains the first step in understanding the composition of the product: read its label. yeast extract , basil, oregano, thyme, monosodium glutamate flavor enhancer. So, the first ingredient (in this case, tomato) is the predominant one in the composition. This is important to unmask products that claim to be "healthy," "organic," and so on, but that cite sugar as the first ingredient. Detail: sometimes sugar comes up with other names. "Sugar can present as fructose, sucrose and corn syrup," explains nutritionist Carolina Oliveira. "There are also products that are labeled 'whole' but whose first ingredient is wheat flour enriched with iron and folic acid," says Stockler. "Thus, instead of containing only whole flours, it has its own white and refined wheat flour." Saturated and trans fats are those that are present on the labels. 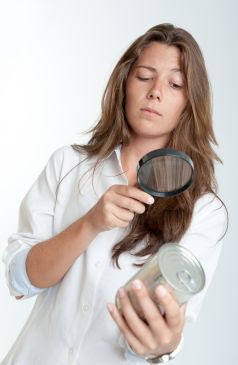 The saturated can be found in animal foods such as meat, chicken skin, cheeses and butter. that kind of fat. In large amounts, it can increase the risk of heart disease, "says Oliveira. Already the trans is a highly processed vegetable fat. It's in stuffed biscuits, fries, ice cream and on your favorite salgadinho, you can go there and see. It has the function of improving the texture and increase the shelf life of the product, ie the expiration date. But it's only good for who sells the product. Those who consume too much may have cardiac complications, because this ingredient is responsible for reducing "good" cholesterol and increasing "bad" cholesterol . This leads to clogging of the arteries and, as a consequence, to increased blood pressure. Therefore, your consumption should be restricted to a maximum of 2 grams per day. Sodium can be found in cooking salt and in processed foods - and requires moderation. "When used in excess, it can be harmful and cause fluid retention and increased blood pressure." Watch out! There are situations where a food can be caloric, but contain healthy fats and high fiber content. Similarly, another product may have a low number of calories, but be rich in sodium or carbohydrates. DIET : here, one of the components, such as sugar, sodium, fat, protein etc., has been removed. They are products suitable for people who have dietary or diabetic restrictions. Thus, the label needs to clearly state which nutrient has been removed or replaced. LIGHT : is the reduction in at least 25% of some nutrient, such as sugar, fat, salt and cholesterol. This usually reduces the energy content and the number of calories. In general, they are foods suitable for dieting. ZERO : are completely free of some kind of ingredient. Therefore, there are products "zero sugar", "zero fat", "zero sodium", among others. Most products are reduced in calories and sugars. This allows their consumption by diabetics or in more restrictive diets. % DV : acronym for Daily Values. It indicates a percentage number that represents how much the product has energy and nutrients based on a 2,000 calorie diet. Portion : on food labels, it informs the average quantity recommended for consumption. Generally, the nutritional values do not correspond to the whole food, but to a portion of 30 grams (two tablespoons), for example. * SOURCES: Carolina Oliveira, nutritionist at Clínica Bem Bonita, CRN 1310033 ; dra. Mônica Johansen Stockler, nutritionist and consultant at Internutri , CRN-3 26979.